We were explorers, braving the wilds, discovering new creatures and landscapes. Danger awaited behind every corner. We were natives, hunting and gathering for our meals, tending our lodge and our fire. We were gypsy rovers, tinkering and creating beautiful items from the things we brought out of the forest. But always, our base of operations was our fort. When we were growing up, every spare minute was outside and a good portion of that time was building and maintaining forts out of whatever we had. Then I got married and found this was a good portion of my husband’s childhood as well. Of course he was a boy scout so he knew the “right” way to make them! Most people I talk to seem to have some good memories of forts in their childhood. 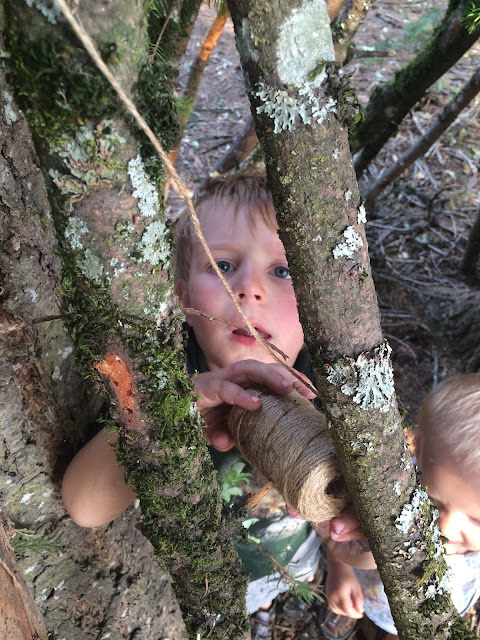 I love that making a fort can mean so many different things, be it a sheet over some chair backs, a platform up a tree, a timber-built structure, or a plastic, store-bought cottage! We even called some low-hanging cedar boughs (where they sweep the ground clean underneath when the wind blows) forts from time to time. When we were packing to move down here, we made the young 'uns a fort out of packing boxes! Isn't it great how the desire to build a shelter can spark the creativity in us!? And how can you not love them? A secret place, just the right size for you that can ignite so many imaginary scenarios? 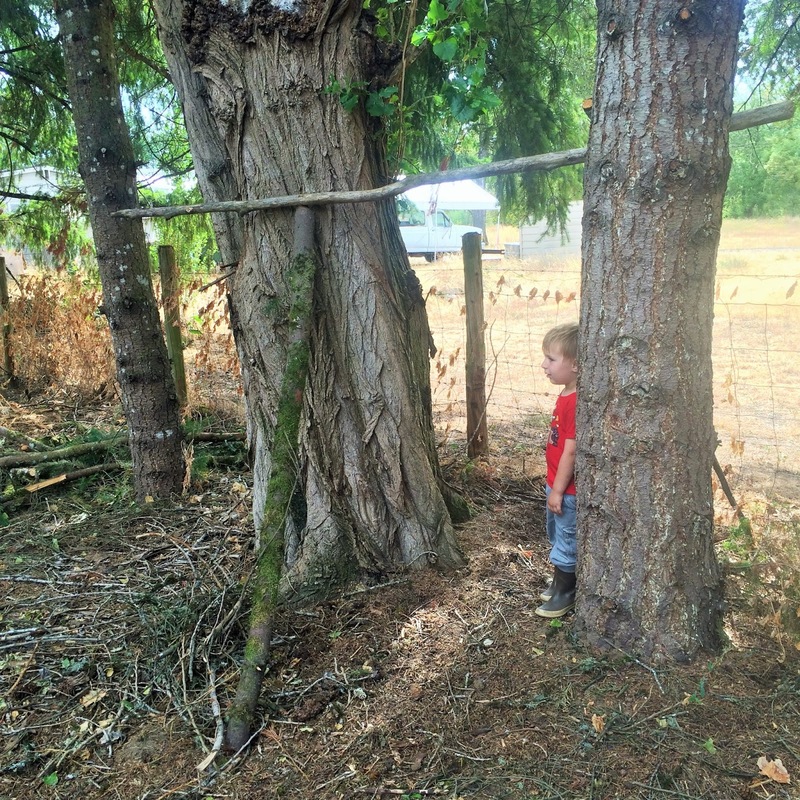 I have been looking forward to sharing this joy with my children for some time now and the opportunity arose this week when our landlord trimmed the lower branches of the many trees on our property. 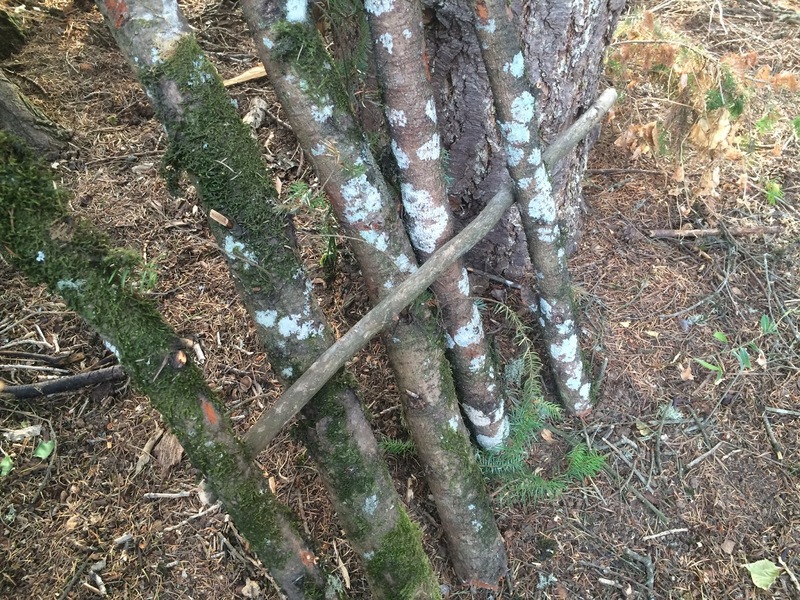 These fresh sturdy branches were perfect for fort constructing! Starting out, I was way more excited about this project than my children. But I decided to just keep at it knowing they would enjoy the finished product (and I was just having so much fun!) They did eventually join in once they saw the fort begin to take shape. Then yesterday when we came home from running errands, as soon as they jumped out of the truck they were begging to go play in their new fort! Their excitement is so encouraging! 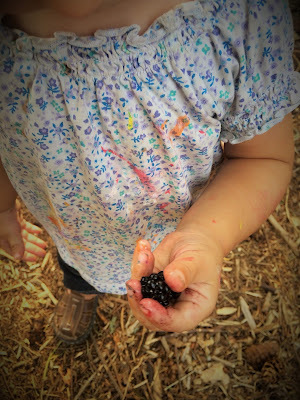 I adore what they come up with on their own when they are just outside with nothing but creation and imagination! To start, we gathered branches and set the cross beam. 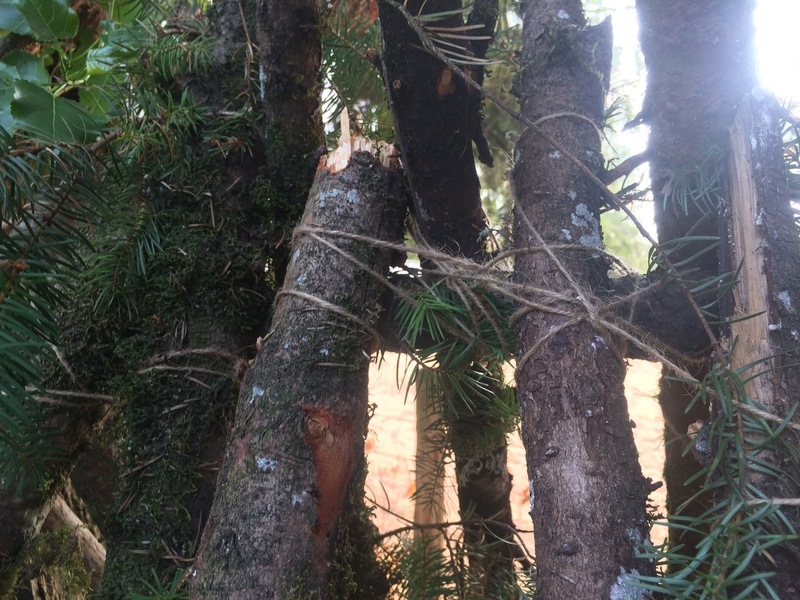 Then we angled branches to form the walls. This was a little easier said then done as our big moose of a dog, Clancey, thought all these branches ought to be his. He would grab these huge sticks in his mouth and try to run off with them. He even grabbed at the ends of ones I was carrying! No doubt these were preferable as they were no longer stationary! We added more branches to the walls and soon we were weaving smaller, more malleable branches in between the larger ones. Look at that shirt! 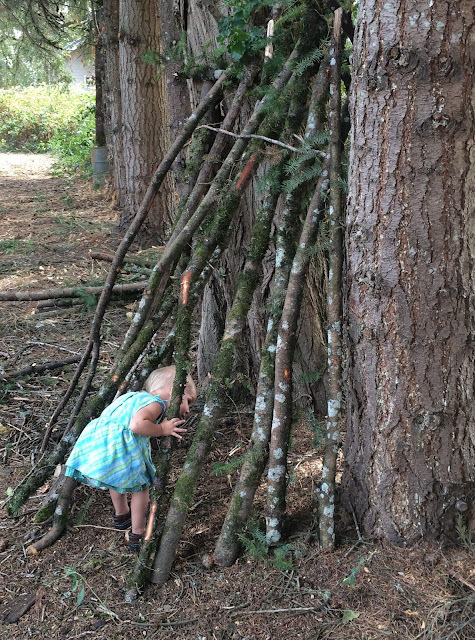 This girl doesn't mess around in her creative play! They started off being "discoverers" who got their supplies together, set off from camp and (you guessed it) made discoveries! Many new bugs, fruits, and rocks were discovered this week! Not long after, they had morphed into rescuers and were seeking out people who might need their help. Love their hearts! My only regret is not setting aside some of the cedar boughs to thatch the walls with! They carted them off before I even considered that step! Oh well, my mighty adventurers don’t seem to mind their extra windows! Well, there it is! Using what was on hand to make their first outdoor fort! Do you have a fort sitting outside your house? How did you construct it? I would love any other ideas for thatching; I am drawing a blank! If you're ever in need of fort inspiration, there's of course some awesome boards on Pintrest. I have several on one of my boards A Time to Go Outside, but I also really love what Jaden put together on this one! Wow! Some of those constructions are incredible! Kind of makes me want to just live in a fort for the rest of my life! Yeah, I never really grew out of that stage! 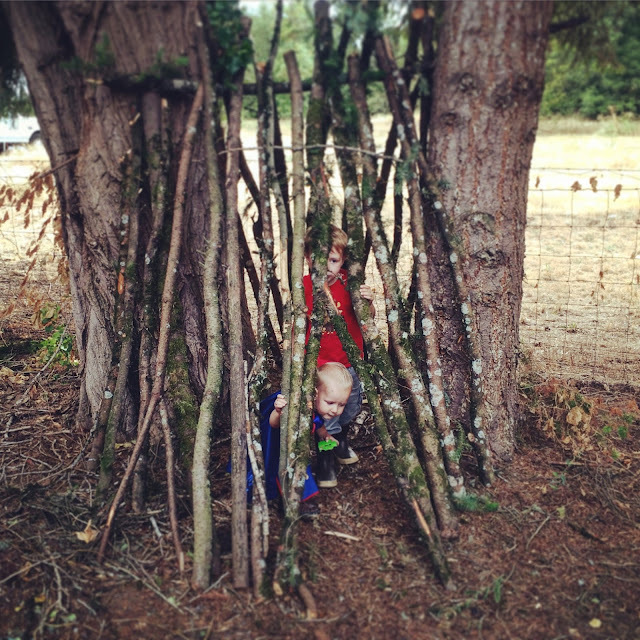 Also, have you read Allison's blog about Fun Fort Friday on her page here. TONS of great fort ideas here! Happy exploring!